What do you do with all those super villains after they get arrested? In DC’s continuity, the most favored spot to place a captured baddie is Arkham Asylum. But in the Marvel Universe, it’s a place known as “The Vault”. Thanks to technology from Tony Stark’s Iron Man armor, the Guardsmen who work security in The Vault are able to keep super powered villains in check even without special powers of their own. 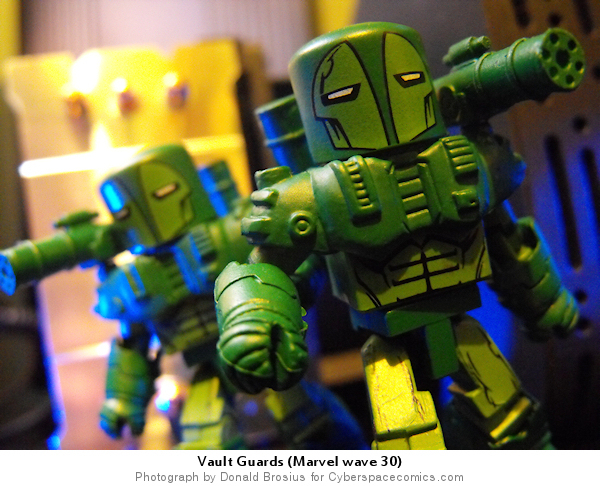 Art Asylum decided to utilize the “Vault Guards” as their army builder for Marvel’s 30th wave, giving collectors a chance to own yet another character (or rather, characters) who may never have been produced otherwise. As I’ve stated in the past, I love playing around with lighting. I also love trying to use random objects as background filler. In this case, I arranged various parts from a computer that I had recently disassembled, and highlighted everything with a few yellow and blue lights. and after that how much consideration. They said they just don’t have to trip throughout the hose.